Do you know the finer points of BC’s distracted driving laws? Are you familiar with the best practices to avoid distracted driving? Do you understand your responsibilities as an employee driving for work, or your obligations as an employer? Please, take a few minutes to complete our 15 question Distracted Driving Quiz. You are catching a ride to your next work site with a co-worker (the driver). In your discussion you agree it’s important to call ahead to confirm that the building inspector will be there when you arrive. You see your driver reaching for their cell phone to make the call, so you _________. Say something like, “Hey, are you sure it’s OK to call in this traffic? Say something like, “I got it. You look after the driving; I’ll look after the call.” Reach for your phone and start dialing. Do nothing. Let them text. It’s their phone and it’s their vehicle, so it’s their decision. Do nothing, and report it to your supervisor later that day (if you aren’t busy mired in reporting the resulting traffic incident). The decision to operate a cell phone or engage in distractions while driving is the responsibility of the driver. As an employer you do not have any authority to restrict them from doing so while at work, or any liabilities if a crash results. Certainly, any fine or penalty points will be directed to the offending driver. However, the employer has a responsibility to establish and implement company policy and safe work procedures aimed at ensuring the safety of your workers and others. Under BC laws, for any driver the penalty for using an electronic device for communicating with another person or device by e-mail or text-based message is ________. There is no penalty for any drivers first distracted driving violation. $368 and 4 penalty points). The penalty is $368 and 4 penalty points. For their first infraction, the driver must also pay $175 Driver Penalty Point Premium bringing the total cost of a first infraction to $543. As well, offences carrying penalty points can lead to the driver being prohibited from driving. While driving, your cell phone sits _______. In your lap so you can handily reach it and text. In your pocket where you can quickly reach for and find it if someone calls. Turned off and securely stored in the glove box, console or trunk. Which of the following is NOT considered to be a distraction to driving? All of the above are considered driving distractions. According to the Vehicle Crash Causation Survey conducted by the National Highway Traffic Safety Administration (2010), 14 different factors were identified as occurring within a vehicle that were associated with driver distraction that resulted in crashes. Sending or receiving text messages takes a driver’s eyes off the road for an average of 4.6 seconds. How far does a vehicle going 80 km/hr travel in 4.6 seconds? 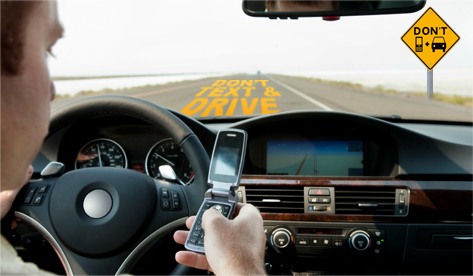 Text messaging while driving creates a crash risk ______ times greater than driving without distractions. Some of your employees drive a company-owned vehicle for work, and some employees drive a vehicle that they own or lease for work-related travel. Under WorkSafeBC regulations, employers do not have responsibilities for workers driving employee owned or leased vehicles. Regardless of who owns the vehicle or where they are driving it, if your employee is engaged in work-related travel, the employer is responsible to ensure the safety of their employees and others. Driving distractions can be categorized into four types. They are manual, visual, auditory, and _______. Visual distractions – Paying attention to visual stimuli (objects, events) that are not related to your driving responsibilities. Searching for a CD, dwelling on the scenery outside, reading a lengthy billboard. Auditory distractions – Listening to something not related to driving; loud music, screaming children, etc. Manual distractions – Using your hands to move, hold or manipulate something other than the steering wheel, or control directly related to driving. Cognitive distractions – Thinking about something not related to driving: daydreaming, a recent stressful conversation, worrying about a work assignment. Which of the following age groups has the highest number of distracted drivers? Distraction.gov states that drivers under 20 are the largest segment of distracted drivers. 16% of all drivers aged 20 years or less who are involved in fatal crashes were distracted while driving. For which age group does being distracted by a cell phone result in the highest percent of fatal crashes? Of the drivers reportedly distracted during a fatal crash, drivers 30 to 39 years old were the group that with the highest proportion distracted by cell phones. Cell phone distraction was reported at 24% for the 30 to 39 year old group, and 22% for the under-20 age group. It’s legal for the driver of the vehicle to send texts while stopped at a traffic light. Texting as you pull into a parking lot is OK, because you are leaving the roadway. The vehicle is still moving as you enter the parking lot. There is an entirely new set of conditions the driver must observe and react to – vehicle backing out of parking spots, people searching for a parking spot, pedestrians, shoppers, abandoned shopping carts. It is not OK to text or talk on the cell phone until the vehicle is parked. It is safe to talk on a hands-free cell phone while driving. There is not sufficient evidence to suggest that talking on a hands-free phone is any safer than talking on a hand-held device. The distraction arises out of the attention you have to pay to the conversation – you are thinking about the conversation, and not about your driving. Take the call and discuss - work related calls are important. Take the call, but tell your boss you will call back in a few minutes. Immediately pull to the side of the road and take the call before the caller hangs up. Ignore the call until you find a safe location to pull off the roadway well out of the way of other traffic, and park. Then listen to the message and/or give your boss a call. Your supervisor knows you won’t answer your cell phone while you drive (because that’s the company policy, and because your phone message says so).